Kerm and I discussed whether we could figure out a pinout for the ASIC. To get an idea of such things, I've started a macro photograph project. By next Monday, I should have a complete composite 100 megapixel or more image of the PCBs for the TI-84+SE and CSE. Kerm may be able to use the information to deduce what pins do what and whether we can overclock the thing! Here's a teaser photo of the TI-84+SE power circuits. You can see two voltage regulators, the ones labeled PCNI and PCFI. For the photo buffs out there, I know there's color fringing and diffraction-limited blurriness. I had to stop the lens down a lot because it turns out the ring flash I have (it's 50 years old, but still works) is far too bright to macro work. I need like 16x neutral density filter. I am pretty satisfied that we already know about the ASIC, the Flash, the display driver, and just about everything on the board except for the possibility of enabling 20MHz/25MHz mode with some judicious soldering. My interest is not even so much whether we can enable the faster modes on our own calculators, as if there is in fact a way to add or remove a handful of components to make the modes available. If yes, then there's a serious possibility (in my mind) that that could become available on future TI-84+CSE calculators. If not, and an ASIC change or major board re-design would be necessary, then I am less confident about the possibility of a speed change. 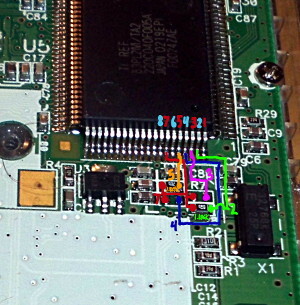 Here's a giant image of the main logic section of the TI-84 Plus C SE. Note that it's far more populated than the TI-84+/SE boards. I'm no EE, but....there's an awful lot of red goop on what appears to be a normal capacitor. Is it relatively high capacitance (for a PCB) and they're worried about arcing on the board, or is there some more plausible explanation? If it's high enough capacitance that arcing would actually be a concern....what role is it playing? There's an awful lot of red goop on what appears to be a relatively normal capacitor. Is it relatively high capacitance and they're worried about arcing on the board, or is there some more plausible explanation? If it's high enough capacitance that arcing would actually be a concern....what role is it playing? That the 32768 Hz crystal, silly. Edit: The goop is mostly there just for mechanical stability, I would guess. That's a crystal oscillator, not a capacitor. I would imagine that's there so that the body of the oscillator doesn't short against the metal antistatic shield. I believe R01H-R04H are key to this investigation. One of my TA3 TI-84+SE calculators has only R03H and R04H, as far as I can tell, both population by zero-ohm jumpers. Another TA3 TI-84+SE has all four pads; R03H and R04H are populated. I tried populating R01H, but the calculator appeared not to power on. Removing the jumper resolved the problem. Populating just R02H yielded the same results. Populating R01H and R02H together also yielded no boot. Tried another set of batteries, no boot. No USB activity, no I/O activity. Removing both jumpers did not appear to restore the device to functionality. However, it should be noted that this is very much a frankencalculator and subject to mood swings, hence my willingness to experiment on it in the first plce. I'm not so sure. At the very least, it probably doesn't apply to the TI-84 Plus C SE. Here's my proof: http://130.85.228.5/photo/IMG_0053.jpg As the image shows, R1H-R4H are populated on my unit, which doesn't have a 20 or 25 MHz mode. The relevant resistors are probably labeled something else. That seems especially likely, since those locations are located right next to the screen connector. Here's a guess: http://130.85.228.5/photo/maybe_its_here.jpg. R287G and R28G (far right of the ASIC) are also suspiciously unpopulated, while R25G and R26G (on the far left) are populated. Can you measure the resistance of the resistors you suspect are responsible for the speed settings, if our hypothesis is correct? They should be zero-ohm resistors. Edit #2: Up to 22.5MHz has been achieved. Up to 22MHz appears stable. 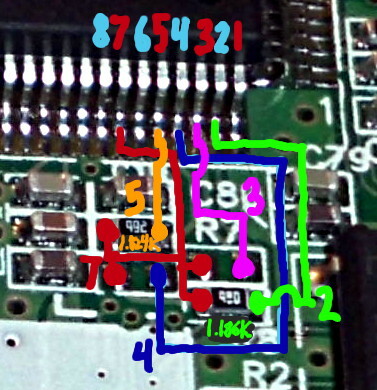 *bump* Although this lead to an extremely fruitful attack at giving the TI-83+SE and friends the higher CPU speeds they always needed, it occurs to me that it might be fun to continue trying to reverse-engineer the pinout of the ASICs. Anyone interested? What would reverse engineering the ASICs accomplish? Would it just mean a more efficient processor? Nooo, that's not what an ASIC means at all. If you think of FPGAs as reconfigurable "processors" (logic, anyway), and ICs and CPUs as completely fixed-architecture computing units, ASICs are something of a hybrid between FPGAs and CPUs. Like FPGAs, they are a complex mix of logic for a specialized task. Like CPUs, they cannot be reconfigured. The ASICs fabbed for cryptocoin mining are specially-wired just for that. The ASICs in the TI calculators are specially-wired for the specified things it needs to do, like handle USB, arbitrate the buses, interface memory, and so on. © Copyright 2000-2019 Cemetech & Christopher Mitchell :: Page Execution Time: 0.229215 seconds.